Hardy Huber is the mastermind who invented the TravelScoot. Recently Elford in Helsinki, Finland sent me an email correspondence he had with Hardy about the lifetime of the lithium ion batteries. You can read more background on this on the post titled "Scooter gang of Vuosaari." I have two of the regular size lithium ion batteries. The first was purchased 2 1/2 years ago. I'm just starting to see some decline in how long this battery holds a charge, but it's still very usable. Every Battery starts deteriorating the moment it is made. In other words, capacity is very slowly decreasing. Eventually there will be a moment where distance is not satisfactory anymore. Rebuilding is not an option because the electronic inside has been improved several times, so all what may be usable is the housing. To get an idea about the condition, I would chose a round course with a known distance and ride with two fully charged battery until one shut down. Since your wife recently got a new scooter you could compare old against new. Joanna is a new TravelScoot owner in Singapore who recently went on a scooter adventure to the Chinese and Japanese Gardens near her house. She's promised us pictures form the Singapore Botanical Garden. Hopefully I'll be posting them soon. Joanna forwarded questions she had about her scoot and the answers she received from Nat Cheang, who owns the Rugged Tree and is the Asian representative for TravelScoot distributorship and dealership. These are Joanna's questions and Nat's answers. If you have comments that might help Joanna, please post them in the comments section. Should you encounter light drizzle, it should not be a problem. But do make an attempt to get out of the rain. I have customers who decide to get some cover for the battery and connection – I also advise them to have some holes for ventilation purposes. There is no specific gradient that we advise against riding. It all depends on weight of rider and how it is ridden. Generally, the slopes that we have on Singapore roads and car park ramps are still manageable. I think when travel with the scooter i should better carry the charger around with me so can charge the battery as and when .... may i charge the battery everyday after use or wait til the orange/red light is on ? It takes how long for the battery to charge when the light turn red ?? I would advise you to charge only when you see the orange light – this is to help you understand how much distance you can travel when the light is green. If you always charge the battery (even when it is green), you won’t be able to discover the battery’s performance. Come to steps how to handle - shall i look for slope for travel always ? If you do come to some areas where there are small number of steps and no ramps around, you will have to carry it up/down. Alternatively, do ask a passer-by for assistance. Compared to other mobility scooters, TravelScoot is very manageable to carry for short distances. Do not have time to go through the user manual yet so ask questions through email will be faster i think. May be will post my question on the Blog - i am very sure those experience user will be delighted to answer my question too. Yes, this is another avenue for you to get your answers and also to read other people’s experiences. I am still planning to have my seat re-padded as per your e-mail. However, I thought someone might like to hear about my experience in buying my TravelScoot. We live in Victoria, BC, and I had purchased 2 mobility scooters before buying my TravelScoot. Needless to say, I was leery about purchasing another one without trying one out. I contacted The TravelScoot warehouse in Chehalis, Washington (900 NW Airport Rd, Chehalis, WA 98532) (www.travelscoot.com) and arranged to give one a trial run. We travelled to Chehalis, and they were extremely helpful. They answered all my questions, and let me drive a TravelScoot outside, as long as I wanted to. I was sold, and am really enjoying owning it. I would recommend anyone wanting to give a test drive before buying to go to Chehalis. I've been a folllower of your blog for a while now since my hubby owns a TravelScoot. 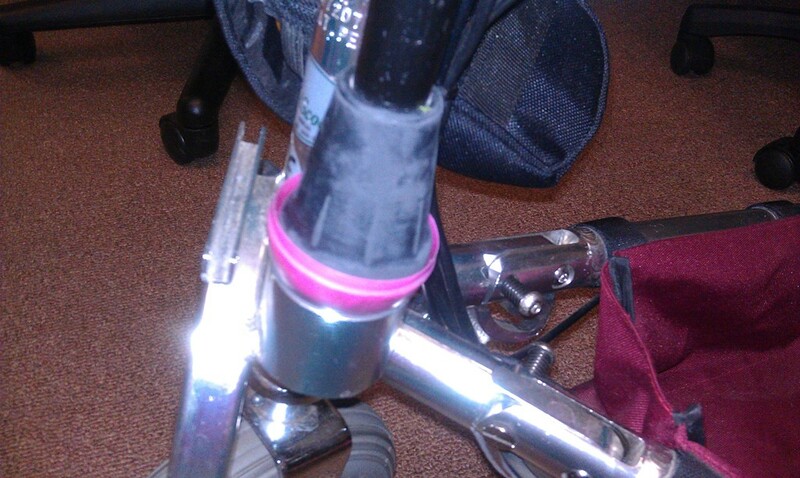 He also had some trouble carying his cane with him because it doesn't fit in the front hole. After some experimenting we came up with a very easy solution...lol......just see the picture. We just put the strap from the front to the back and when pulled tightly the cane stays put very well. So, if someone uses the back part of the seat, this might just be a good idea! I did buy a TravelScoot and found it to be very useful. My granddaughter wanted me to teach her ride a bike. I told her I wasn't able to. She was very disappointed and I think she thought I was just being lazy. I got the TravelScoot and that the first thing I did. I grabbed the back of her bike seat and off we went. Got her riding the bike right away. Will send picture soon. Thx again for all your help. Frank is a new TravelScoot owner. He's just returned home from an adventure and has comments and questions. If you can answer these questions, please post them in the comment section or send them to me at elizabeth@ifisher.com. Thanks! Well I am home again, after a most interesting trip to Los Angeles, San Francisco and a cruise down to Mexico etc. and through the Panama Canal to Miami, taking in the Everglades, then back to Oz again. ‘twas a really delightful 3 ½ weeks of brilliant sunshine and not too hot weather, although in some places it was very humid. But to wrap it all up, it was a lovely holiday I could, most certainly, have not done without my trusty Travelscoot, aka my “Ferrari” by various waiters and coach drivers. Especially the Yosemite Valley and Muir Woods were fantastic. I now have my eyes set on further trips overseas. I am especially interested to know whether any of your Travelscooters have ever been on a cruise up the Rhine or similar Rivers in Germany. There are some trips from Amsterdam to Budapest, for example, which I would love to go on, but I am wondering whether the many beautiful old towns and villages where one pulls in are Travelscoot friendly, or whether they are too rough (cobblestones) for my scooter to handle. I have travelled along some of this route many years ago when I was fit and healthy but my dim memories recall them as being fairly tough on legs and possibly even worse on small wheels, but things may have changed in the past 50 or so years. Or have they? Could you please find out if anyone has traversed this part of Europe? I have another question. I notice that you, Rhonda and Elizabeth have treated yourself to a new padded seat. (For the Travelscoot, I mean). Not only do I think that this was a great idea, given that I had quite a “numb bum” after spending countless hours in Disneyland, Paramount Studios and the aforementioned sites in California, but I am wondering whether the new comfort (thickness) of the seat compromises my ability to pack the scooter in its canvas carry-bag, as I always travel with it “packed”. I prefer to be escorted through the tremendous air terminals by wheelchair. that I was most surprised that this product was not more widely advertised. In one instance a whole group of Japanese tourists crowded around me and through an interpreter was asked a lot about it and photographs were taken. I was very deeply impressed by the care and attention given to the disabled in your country, and yet I found it interesting that your street corners had very narrow gradients to the roadway, so one had to be extremely careful when crossing, lest one may accidentally run into the back of another pedestrian when crossing. I wanted to send a note of thanks for the work you do with your website. I found the TravelScoot website while surfing for mobility scooters. I have looked at many different brands but was immediately drawn to the TravelScoot. My Mom used a mobility scooter due to a severed nerve in her ankle from orthopedic surgery. She only able to take a few steps. Her scooter was heavy, cumbersome and she could not manage it by herself. I swore I would never go that route. I suffer from several chronic health problems and had to retire on disability a year ago. I have traumatic arthritis in my left knee and have been on a cane for several years. I also suffer from diabetes, a bad back and congestive heart failure. I have gradually had to curtail my activites over the past few years. Last year my heart failure worsened and I am only able to walk short distances without getting short of breath. I am no longer able to go to the grocery store, Walmart or any place that requires walking any distance. I was slowing becoming more isolated and homebound. Then I found the TravelScoot website. As I said, I have spent lots of time on the internet looking at scooters. They all make lots of claims about ease of use but all require some type of hoist to get them in/out of vehicles. TravelScoot also makes claims about ease of use. The difference is the videos on the website showing how easy it really is to use. However, I am a big (not tall) man and was very concerned about the TravelScoot being able to handle my weight. I saw the cane post today and thought I would send you my customization. My new cane has a bigger tip and it did not fit in the scoots can cup. I had a plastic Easter egg in my drawer that the cane end fit into so I punched two holes in the bottom of the biggest half of the egg and ran a wire through them then wired the half an egg on top of the scoots cane holder. Works great. 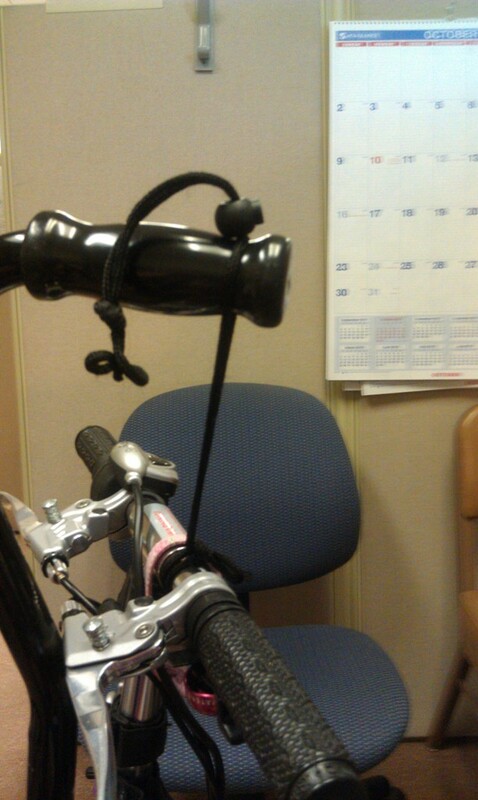 To hold my cane up by the handlebars I use a drawstring. For many of us who suffer from lymphedema walking great distances is a problem when your legs are wrapped or in compression bandages. I tell people frequently that I couldn't do 180,000+ miles/year travel if it wasn't for my TravelScoot but even in my home city, Omaha, it allows me to be mobile. I was at a hospital yesterday receiving massage therapy on my legs and as I left on my scooter I saw an old man with a cane struggling through the hospital and I heard him say "That is what I need". I agree with him but many people are too proud to acknowledge their lack of ability to move around and suffer needlessly when they could be using mobility aids. I think the best thing we can do as happy users is to help spread the word and explain why people should use TravelScoots. I have heard people say cruel things like "It just makes you lazy". If they think that users would use them if there was an alternative, they are crazy. Stroke victims, people recovering from leg surgeries, are all good candidates also. The TravelScoot seat, just as it is originally, is a comfortable seat. I've seen it described on the TravelScoot website as being as comfortable as a good dining table chair. I think that's a good analogy. However, if you spend all day getting on and off it, like at Disney World or for a day at the mall, you might wish there was more padding. Bee and Denise recently shared pictures of their reupholstered TravelScoot seats, and that inspired me and Rhonda to find a place near Baton Rouge to have our seats done too. We can't let Bee and Denise have all the fun! Airline Glass and Upholstery, Inc.
Two weeks ago we took at trip out to Airline Glass and Upholstery with both our TravelScoot seats. We met with Stephen, whose expertise is recovering motorcycle seats. Both Rhonda and I were quite pleased with how much time he spent explaining our options, and how enthusiastic he was about recovering our seats. He showed us several options for foam and upholstery material. The material was available in an array of bright colors, and he could order just about anything we could imagine. He also said he could do intricate things like embroidering flames on the seat. In the end we went with something more basic, but it's nice to know the sky is the limit as far as creative possibilities go. Stephen even agreed to take photos for this blog while he was working on the seats. I hope I can do the pictures justice when I explain our options. Both Rhonda and I have the larger size seat. This is what Rhonda's seat looks like naked, before any new foam is added. This is Rhonda's seat after adding 3 inches of foam padding. The blue on top is 1 inch memory foam, and costs about $30 a square foot. Stephen said this is the manufacturer's price, not his. The pink foam is a softer foam, and I believe it was between $4 and $6 a square foot. This is my seat. The original foam on my seat is a different type that what is on Rhonda's. We bought them at different times, so they were probably from different shipments. The blue foam you see on my seat is NOT memory foam, it's just a less expensive foam that's fairly dense. I chose to put it on the bottom and have the softer foam on top. The pink foam is the same as the pink foam on Rhonda's seat. This is what the finished seat looks like. We both chose the imitation ostrich black vinyl. I went there thinking I'd go with a bright color, but I use my scoot at work and I don't want anyone thinking it's just a toy or convenience. There was also the problem of any other color clashing with the fabric triangle pouch. The total cost for my seat was $75 and the total cost for Rhonda's seat was $120. He had them finished in one week. The price difference between the seats is that one had memory foam and one did not. The larger seats require about 1 1/2 square foot of foam per layer. We have each been using our seats for a week now, and we got together today to swap seats and see how they compared. We got Melissa in on it too, because she hadn't tried either seat yet. The general consensus is that Elizabeth's seat is a little softer and Rhonda's seat absorbs impacts a little better. Both seats absorb impacts better than the original seat, and we all judged both seats to be more comfortable that the original seat. We all also liked that the extra padding allowed us to sit up a bit higher. In the end we each feel like we got the seat that was right for us. If our experiment had failed we would both have gone back to the original seat and been fine with it. It's a good seat too. If you go to a local auto upholstery stock to see about having your seat redone, keep in mind that if they have to special order the fabric, you're going to pay more for the seat. The place we went carried a nice selection of fabrics, but if we'd wanted purple like Denise got (and don't think it didn't cross my mind! ), we would have had to pay postage for the fabric shipment, and any extra cost involved in such a small fabric order. Getting a stock fabric certainly made it come out less expensive in the end. 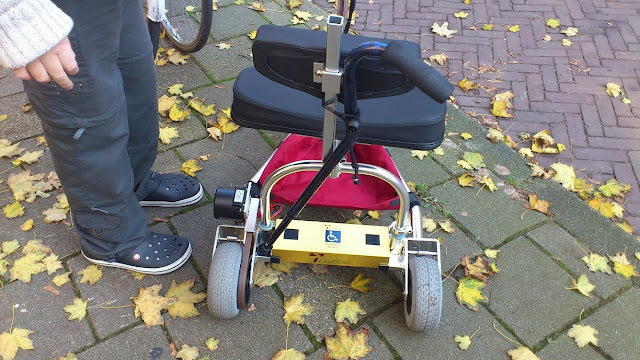 There is a cup near the footrests on the TravelScoot designed to hold a cane or crutches. 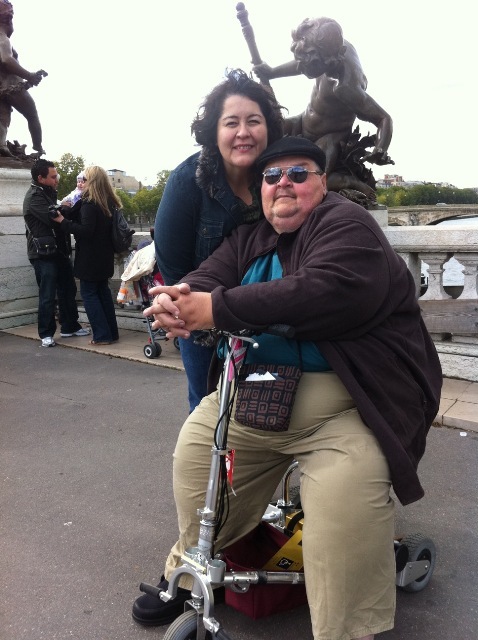 In the picture above you can see how Rhonda has tricked out her scoot to hold the cane in place near the top of it. That's an elastic headband she's doubled over to make it work. It's decorated with an embroidered button from Karen's Creations. Today Rhonda, Melissa and I got together at Target to test out mine and Rhonda's newly reupholstered seats. (We'll get to that topic soon.) While we were there Rhonda showed us the new shopping cart she'd gotten. Melissa took it for a test spin and gave it good reviews. Rhonda also told us there was an even larger size available, and of course we had to leave Target and scoot to Office Depot (three parking lots away!) to check it out. I'm so glad we did because that gave us a chance to meet Michael, who not only showed us where the larger cart was located, but put one together for us so we could try it out. posing for us. He was thrilled to hear he was going to be featured in our blog post. I love his "Office Depot goes Broadway" pose! and holds 80 lbs. You can see them on the Office Depot site here and here. This is Rhonda's new shopping cart. It came from Office Depot, and costs about $20. According to the manufacturer it can hold 60 lbs. You can see it on Office Depot's website here. This is Melissa, shopping in Target with Rhonda's new cart. She said it worked well for her. Rhonda said to let you all know that it folds up and stores easily in her vehicle. Here is a picture of my new cap. Which I had made up for me. In about 2 weeks time I will be taking my TraveScoot on a boat Cruise for 16 days on the Sun Princess to New Zealand. Jugana is a brand new TravelScoot owner with a question. I found very useful info about CrampBuster on your blog. As I am disabled and have weakness in my hands too it's very hard for me to pull the brake levers. It's not a problem when driving on even grounds as the drive is mostly defensive, but as my hometown is all in hills, it's very hard for me to go downhill as brakes should be applied for a longer time. Maybe you or some of your friends could have a suggestion what to do. To your knowledge, is there something like CrampBuster for brakes too? 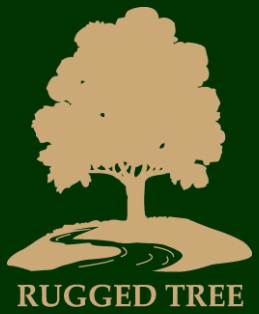 If you have a suggestion for Jugana, post it in the comments or email it to me, elizabeth@ifisher.com. If you'd like to see Jugana's blog about travelling with a disability, visit http://handinhappy.blogspot.com/.